A business without a plan is a dead business; an intranet without a plan is a dead intranet. It may wither slowly into something pathetic and useless, barely breathing, almost vegetative, but it is dead nonetheless. Failure to develop an integrated plan that accounts for an organization's structure, stakeholder and user requirements will certainly ensure failure and, with it, a loss of significant time and resources. Too many intranets fail to live up to their potential because they lack direction, and often become a political football that is fought over by rival groups with competing priorities and visions. In the context of planning, I’m focusing on high-level planning and strategy – not to be confused specific, tactical plans. Strategic planning must come first and detail the intent and direction of the intranet with specific, measurable objectives or outcomes. For an intranet to be successful, it requires at minimum, two of the above elements, including money. Where an executive champion really earns his or her grade is in their ability to cut-through corporate politics. It’s true that most intranets suffer because the organization doesn’t give it the funding it needs, however, without the political will and clout to secure that funding, and to cut through internal politics, the intranet has little chance to be of value. For example, corporate communications and IT see the intranet very differently, and to them HR is from another planet; each have differing views and priorities for the intranet. To cut-through these competing views and politics, an executive champion serves as the final say or the ultimate judge or trouble-shooter that can quash these competing politics. Of course, your executive champion must be a direct report of the CEO (or equivalent) or the chief themselves – someone that has clout and budget. It’s often the head of Communications, Marketing, HR or IT (CIO), but it doesn’t have to be. Some of the greatest intranets I know have as their executive champion, not surprisingly, the President or CEO themselves. The intranets' potential value flows from the C-suite. 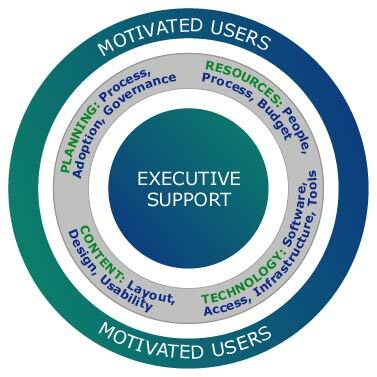 When appropriate executive support is present, the remaining planning components flow from it – namely the next most important ingredient, resources. Resources are mainly money, and people, but can include hardware and supporting technology. But chiefly, we’re talking money. The buck stops in the C-suite; and the bucks flow from the C-suite. Hence the importance of the executive champion discussed above. First you get the power (executive), then you get the money (funding), then you get the people (and users). It’s that simple; there’s not much more to say. However, often to secure the necessary funding, a sales plan or presentation is necessary – to demonstrate the potential value of the intranet. Most CEOs and executives don’t know what a good intranet is, don’t understand the value it can bring to an organization, and frankly, don’t care. This is one of the reasons why the intranet is so poorly funded (often with a budget that is dwarfed by the website that may enjoy 50 or 100x the budget of the intranet). Many of these issues and lessons were covered in our last webinar, How to Sell an Intranet Redesign to Your Boss. Too many organizations skip a mission or vision statement all together – they believe it’s superfluous or altogether too vague. Were this misplaced notion true, why then does every effective company on the planet have one? 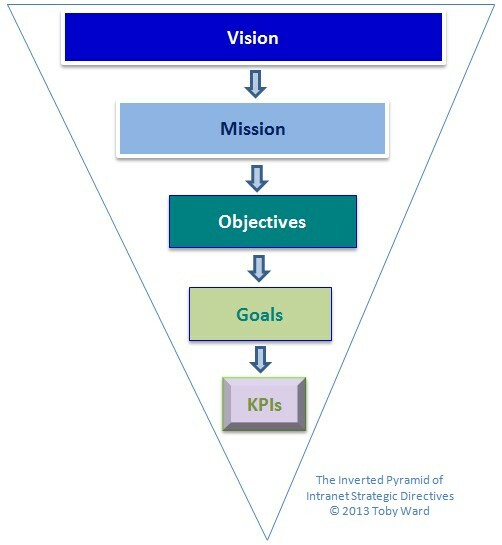 A mission / vision statement is mandatory, and the key intranet owners / stakeholders must agree to its composition. The statement itself is less important; what is important is the process and collaboration or consensus in formulating the mission / vision. The aforementioned politics between communications, IT, and HR are far more easily overcome when you gather these key stakeholders – and any others – in one room, around one table and agree on a mission / vision. This is where cooperation begins, and when it’s done, the creation of goals, objectives and specific tactics (including the end design) will flow more freely and easily, and petty differences and competing priorities more easily overcome. A mission statement states the ‘what’ the intranet does, or ‘how’ it will improve the organization; a mission establishes an overarching goal. A vision statement paints a picture of the end state: what the intranet will become. One is no more important than the other, and both together are not necessarily needed – one will suffice. Again, what is important is not the end statement(s) themselves, but the process and consensus achieved as a result. As you can see from the above, mission statements can come in all shapes and sizes, and lengths – some are a mouthful, others short and sweet. But there is no wrong or right mission, as long as all of the key stakeholders agree to it, the mission is a good one. There are differing definitions of goals and objectives, depending on the institution, expert or consultant. Often, a goal and objective are used interchangeably, with one being high-level, and overarching, and the other being specific, and measurable. When I began strategic planning for intranets, some 15 years ago, I adhered to a standard definition, offered and reinforced by Harvard Business professor Michael Porter, that a goal was something specific, and measurable. Today, in some organizations, an objective is specific and measurable – a strategic directive that falls under a goal – and a goal is high-level, and overarching. Of course all of the above require baseline measurements which should be undertaken during an assessment, and measured against in regular, finite intervals (e.g. every quarter, year, etc. ).